White opaque film is a popular choice of specialty window films due to its many uses and advantages. It provides privacy in bathrooms, showers, board rooms and various settings. It lets in the light, without being able to distinguish any visual detail regarding what is on the other side. 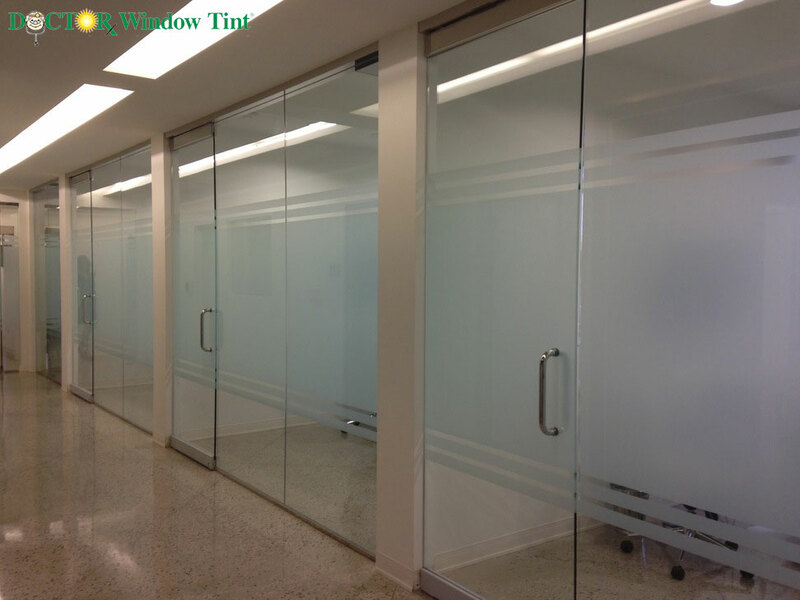 Frosted film is a versatile product in the office setting with a variety of uses. The office environment places value on privacy. This often involves heavy draping or tinted windows. The darkness that this inflicts can create an oppressive atmosphere in an already potentially stressful environment. Sun that shines through white opaque film creates a lively and fresh environment, and reduces glare, thereby creating a productive environment that is void of distraction. On the interior, the office glass is aesthetically pleasing while still maintaining a level of privacy with the opaque film. The glass is easier to clean and maintain than blinds and drapes, all that is required is normal window cleaning agents. It is a quick and easy way to add a new look to your office space. The added benefits of normal film are also applicable – furniture is protected, glare is blocked, and the temperature is regulated. The film adds an additional layer of security, functioning as a durable material that is difficult for thieves to break in, and a deterrent for peeping intruders. White opaque film is popular in the bathroom because of the privacy it offers without decreasing the size of the room with extra walls. There are other benefits to choosing white opaque film as your specialty window film. For example, white film does not go transparent when wet. This means that privacy is maintained if water from the shower or bath splashes on the glass. Another instance where privacy is maintained is that the film on the window prevents people on the outside from being able to glance in. Vision into the room is blocked, but the light of the sun isn’t. White window film in the bathroom preserves natural light, maintaining the fresh and clean atmosphere that is demanded of a bathroom. Hygiene in the bathroom is very important. With white opaque film on the glass, dirt becomes more apparent which means that the glass is cleaned when needed and not forgotten about. An additional bonus is that the film makes the glass shatterproof. With an extra durable layer, your bathroom glass is therefore less prone to damage and breakage. This is a safety feature perk which is often overlooked. A popular reason for using opaque white window film is for aesthetic reasons. It works very well to let light into a room, filtered through a film that is bright and ‘fresh’ in appearance. It is most often used in bathrooms, shower rooms, toilets, offices, and school rooms – all settings that prioritize a clean atmosphere. White opaque window film is an easy way to add a decorative (and practical) edge to a room, priding itself with easy installation and maintenance. Depending on your need, specialty window films can be decorative in an assortment of styles.